Employee Engagement 2010. I am committed to conducing a 1 person study of engaged working for 2010. It will be a personal learning lab with the expectation of value to readers giving them a model and format to focus and reflect on their own engagement. From the woods to work. I will use a phenomenological approach to a year by tracking and recording my engagement everyday. In addition, I will write an entry once a week chronicling my engagement in work. I think of it as an external H. D. Thoreau’s, Walden except that rather than a retreat to a pond and the woods it will be engagement in the daily flow of work. 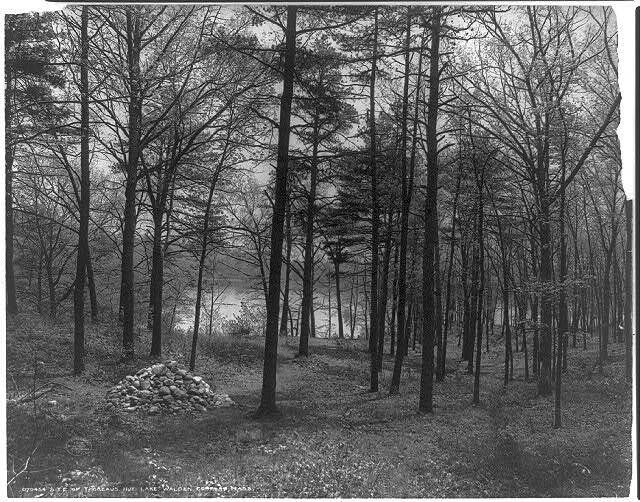 The site of Thoreau’s cabin at Walden Pond from Wikipedia. Blog feature: This will be a weekly feature of this site during 2010 – the regular posts, poems, and cartoons will also continue. I went to the woods because I wished to live deliberately… and see if I could not learn what it had to teach, and not, when I came to die, discover that I had not lived. If a man does not keep pace with his companions, perhaps it is because he hears a different drummer. Let him step to the music which he hears, however measured or far away.” By doing these things, men may find happiness and self-fulfillment. Thoreau’s work was part personal declaration of independence, social experiment, voyage of spiritual discovery, and manual for self reliance. My goals are not so lofty and rather than a book they will be chronicled in a blog. Purpose of the project: The purpose of the project is to bring, intention, mindfulness, attention, and reflection to my daily engagement in work. I decided to be public with this to encourage others to be more intentional, mindful, and reflective of their work engagement. I plan to uncover patterns and sharpen methods to enhance engagement. I also want to develop tools, tactics, and approaches that others can use to improve their own engagement. Detaching engagement: The engagement I will write about here is attached to my work not my role. I see it as more about work engagement than employee engagement and I believe that is one of the steps we will all need to take in this decade is to detach engagement from just the role of employee and attach it to work, organization, leader, manager, project, performance, etc. Personal-Universal Link. From one perspective this seems like a very personal project for 2010 but I have also learned from 25 years of teaching and offering counseling psychology that often the most personal can be the most universal. I do not intend this to be some kind of myopic naval gazing but a reflective voicing of experience with the reader in mind at all times. Results or contributions are both the focus and outcome of engagement and this daily recording and weekly reporting will improve both results and contributions. Conscious use of strengths, especially in the service of others, will foster fuller engagement. Bountiful and robust connections with others will be the strongest challenge and biggest contributor to my own personal development with engagement. The return on energy from work will need to be greater than energy invested to sustain high levels of performance. Work will need to be an energy gain not drain. It will be a challenge to sustain the recording and reporting for a year. Engagement levels will fluctuate not just on a day-to- day basis but within each day. This study will result in a much stronger personal focus and action on energy, connections, strengths, and results. I believe I will experience heightened levels of engagement because of mindfulness and public declaration. Waldon 2.010 Structure: I have created a personal Google survey form to enter each day’s engagement. Each entry will include a brief and subjective paragraph about the day. On certain days this will be supplemented with quotations or questions. In addition there will be a rating of engagement each day on 5 variables and an overall percentage rating of engagement. 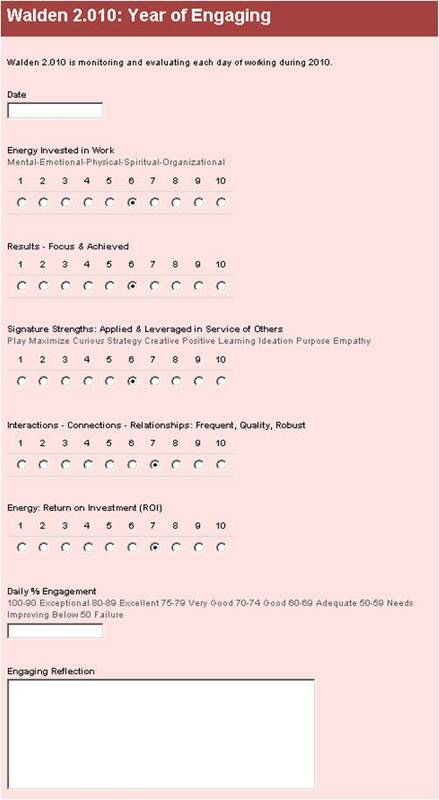 The engagement rating variables. Each variable will be rated on a scale of 1 to 10 for each day with 1 being a very low score and 10 being maximum engagement. Energy Invested in work. The amount of energy I invested in my work for that day. Results. An assessment of the accomplishments, productivity, contributions, and results for the day. Signature Strengths. Acting on strengths and leveraging strengths in the service of work. I will use a fusion of the VIA Signature strengths and Gallup’s StrengthsFinder 2.0. Interactions, Connections, and Relationships. The frequency and intensity of connections with others (co-workers/customers/clients/students/etc). Daily Energy Return on Investment of Energy. The amount of energy derived from my work each day. Wow, what a project! Brilliant idea I am looking forward to strapping on my virtual walking boots and going on a woodland journey to follow your engagement footsteps. Happy new Year, what a way to start it! It certainly has not been a walk in the woods yet. Some early challenges but the honesty and mindfulness will be quite key here. Lots of early fluctuation in all 5 measures so far.